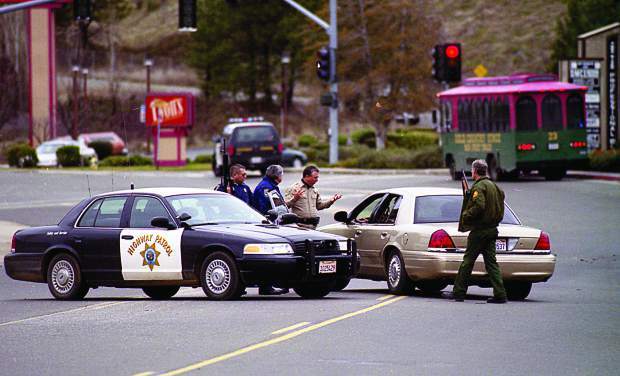 Law enforcement officials blockade Nevada City Highway next to the site of the former Lyon's Restaurant, one of two sites involved in the Jan. 10, 2001 shootings that left three dead and three seriously injured in western Nevada County. 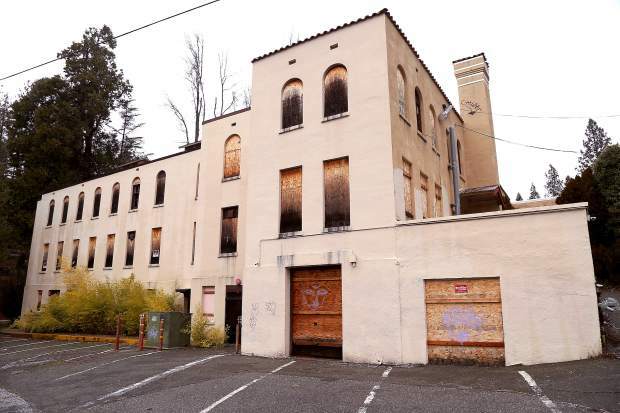 The former Lyon's Restaurant, where Lumberjacks now operates, was one of two sites involved in the Jan. 10, 2001 shootings in western Nevada County that left three dead and three seriously injured. 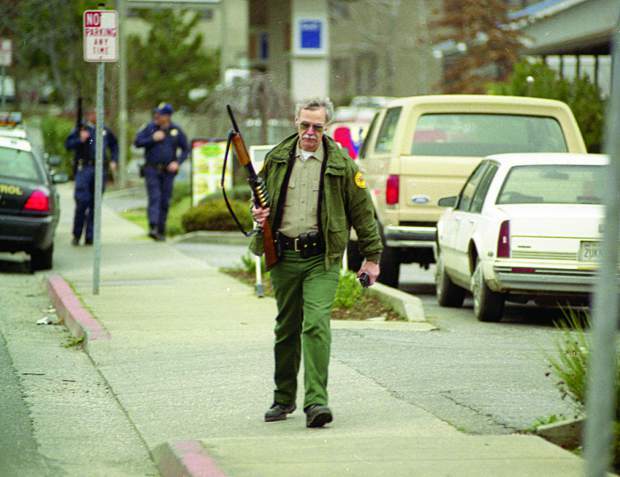 A California State Parks officer walks with a shotgun down Nevada City Highway, near Lyonâs Restaurant on Jan. 10, 2001, as law enforcement search for a gunman who killed three and seriously injured three more. HEW Building in Nevada City. 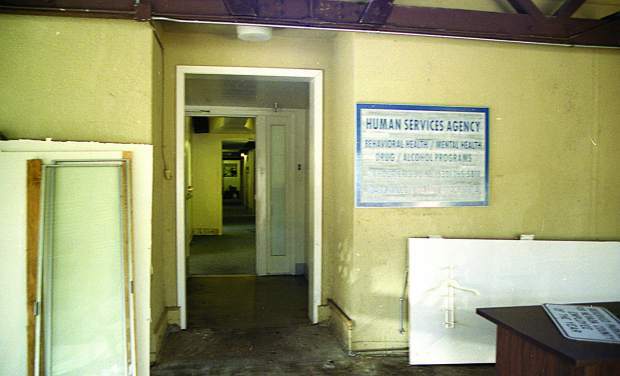 The interior of the HEW Building in Nevada City, five years after the Jan. 10, 2001 shootings. 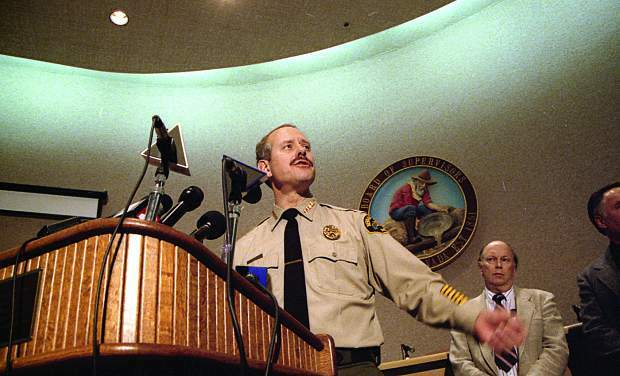 Nevada County Sheriff Keith Royal provides an update to media on Jan. 10, 2001, the day three people were shot and killed and three more seriously injured in western Nevada County. 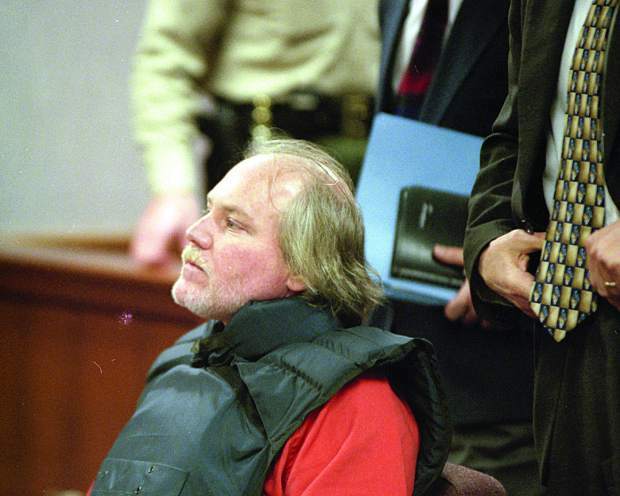 Scott Harlan Thorpe sits in a courtroom, in this 2001 file photo, following his capture and arrest in the Jan. 10, 2001 shootings. 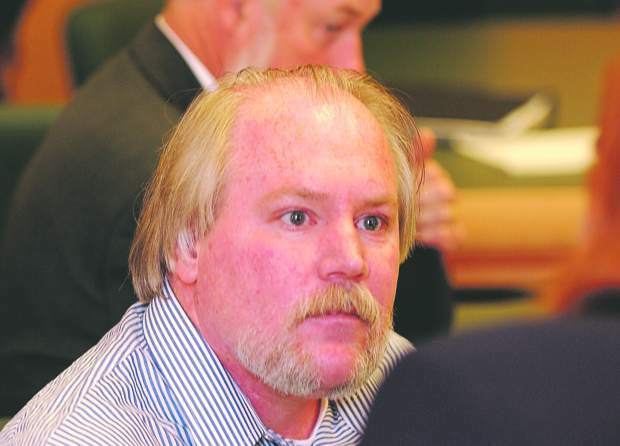 Thorpe was found not guilty by reason of insanity and remains in custody at Napa State Hospital for the mentally ill..
Scott Harlan Thorpe listens to Deputy Public Defender Jody Schutz in a courtroom in this May 2003 file photo. 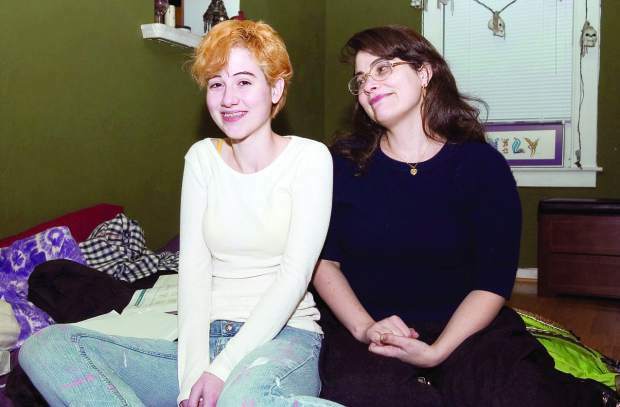 Thorpe was found not guilty by reason of insanity and remains in custody at Napa State Hospital for the mentally ill.
Daisy Switzer, right, shown with daughter Emily in this 2006 file photo, was seriously injured jumping from a window at the HEW Building during the Jan. 10, 2001 shootings. 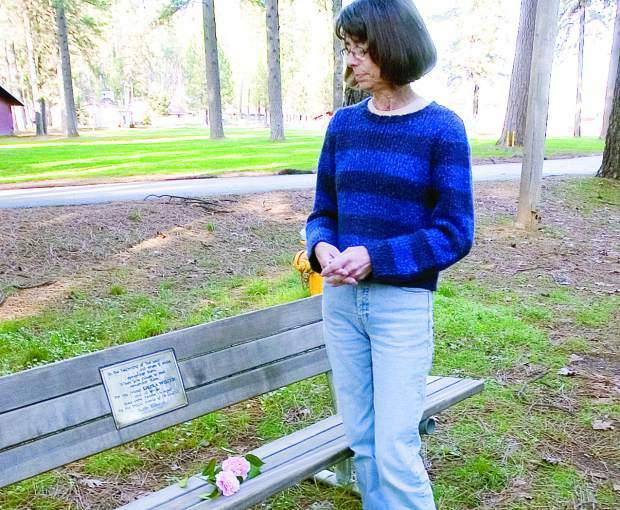 Judith Edzards, who sustained multiple gun shots â to her head, lungs, esophagus and right shoulder â in the Jan. 10, 2001 shootings in western Nevada County, stands next to a bench in this 2006 file photo at the Nevada County Fairgrounds that she dedicated to Laura Wilcox, whom she hired as a receptionist in the county's Behavioral Health Department. 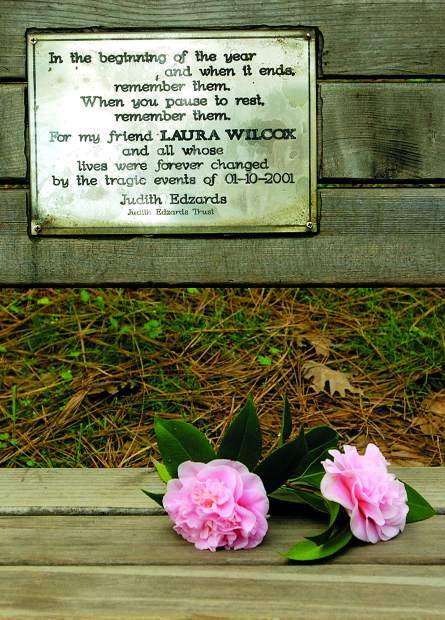 A plaque placed on a bench at the Nevada County Fairgrounds by Judith Edzards, a survivor in the Jan. 10, 2001 shootings, is dedicated to Laura Wilcox, whom she hired as a receptionist in the county's Behavioral Health Department. 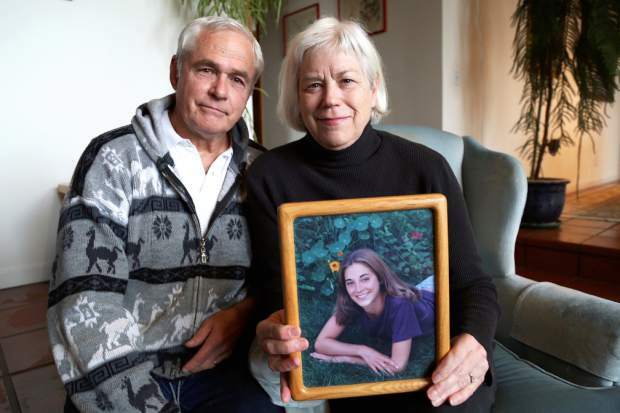 Nick and Amanda Wilcox with a photo of their daughter Laura, who was fatally shot on January 10, 2001. Editorial: Has the county done enough for mentally ill? 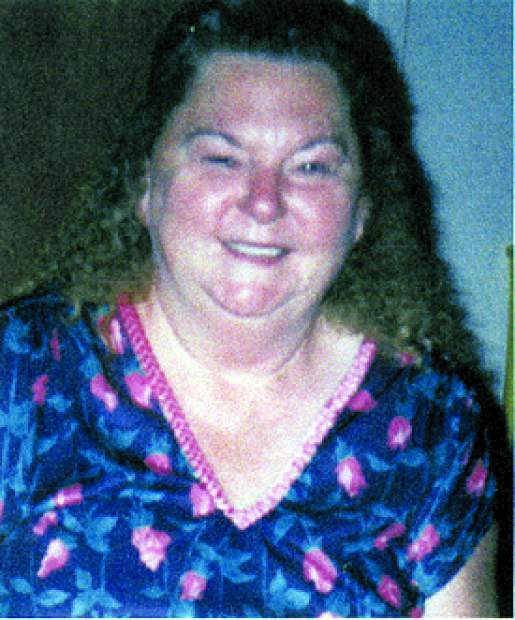 The time crept close to 11:30 a.m. Jan. 10, 2001, and Kim Cuisinot was on break. Cuisinot, a behavioral health therapist, worked in a modular building close to the old HEW Building, on Willow Valley Road. The building held the county Behavioral Health Department offices, among others, and had employees scattered throughout its floors. One of those employees called Cuisinot on the phone. Someone had chocolate at the front office. Cuisinot should get some of it. She began the two-minute walk to the main building, stopping when she realized a forgotten set of notes in her office. Cuisinot returned, grabbed her papers and started toward the chocolate. 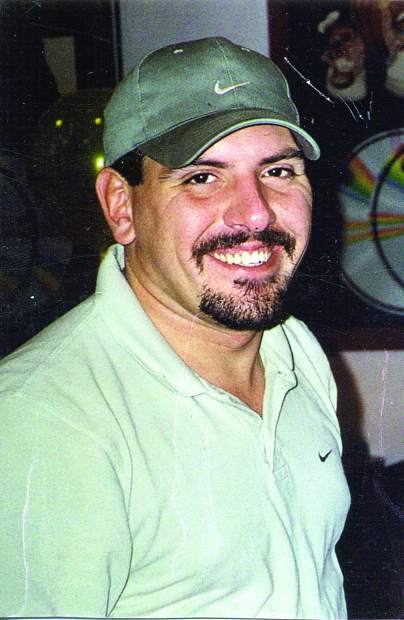 Scott Harlan Thorpe walked inside the HEW Building around 11:30 a.m. that day. He opened fire, killing 19-year-old Laura Wilcox, a college student filling in for a sick colleague, and Pearlie Mae Feldman, also in the reception area. Mentally ill and resisting treatment, Thorpe left Willow Valley Road and went to Lyon’s Restaurant. There he fatally shot 24-year-old Michael Markle. 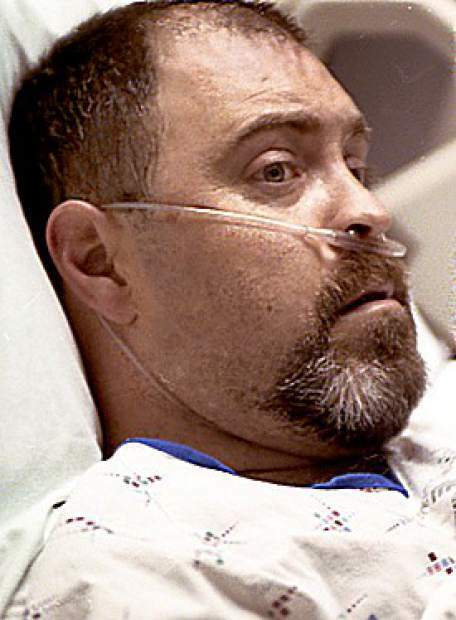 Thorpe’s actions 15 years ago arguably became Nevada County’s greatest modern day tragedy. The shooting led to hours of fear spread across the county in a time when cell phone ownership was uncommon and coverage spotty. Employees huddled in their offices, ignorant of what was happening. Officials used car hoods as a base of operations. The sheriff’s office didn’t yet have its mobile operations center. Schools and businesses closed as people tried to reach loved ones. A pall drew over the county as law enforcement searched for the shooter. That day — Jan. 10, 2001 — ended with three dead and three wounded. Thorpe, the shooter, went to his Mooney Flat Road house after the shootings and called his brother, then a Sacramento policeman. Thorpe told his brother what happened and authorities apprehended him later that day. Thorpe was found not guilty by reason of insanity and was sent to the Napa State Hospital for the mentally ill. According to Nick Wilcox, Laura Wilcox’s father, Thorpe remains at that facility today. A two-minute walk from the front office, Cuisinot opened the front door after grabbing her paperwork. A man approached who told her to call 911. Someone was shooting, he said. Cuisinot could hear it. Cuisinot and co-workers in the modular closed the mini-blinds before hiding. She crawled underneath a desk. “We wanted to run, but we didn’t know how many shooters there were,” she said. 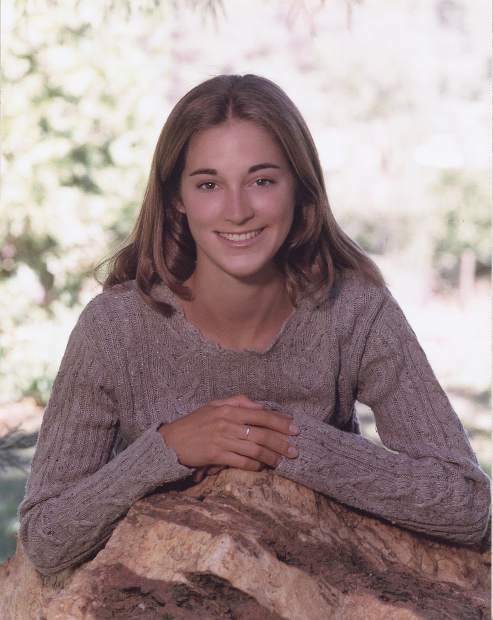 Julia Robertson, also a behavioral health specialist, found herself in a similar situation. Her office was on the same floor of the shooting. At her desk, Robertson heard a popping noise and people yelling. She thought people at the nurses’ station were popping balloons. Robertson saw no one. She picked up her office phone and called a nearby co-worker, who’d served in Vietnam. Robertson asked him about the noise. He told her to remain in her office. 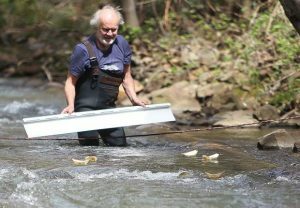 “I kept hearing screaming at the same time,” Robertson said. She feared to escape by the stairs, as she didn’t know the shooter’s location. There could be multiple gunmen, she figured. There was no way to know. Daisy Switzer, in an office next to the reception area, felt the same. Inside her office, she closed one of two doors to her room about two minutes before Thorpe entered. Switzer, who has a daughter, said she made a calculated decision. She called 911, as did many people in the area, and then jumped about 2½ stories from an office window to the concrete below in an escape attempt. She escaped the gunman. In fact, Switzer never saw Thorpe that day. The fall, however, broke several bones. Mended after 15 years, the injuries still trouble her at times. Above Switzer, on the floor from which she’d jumped, Robertson scanned her office for something to block the door. She then quickly hid underneath her desk. Robertson called 911 and found the line busy. Unknown to her, Thorpe had gone to Lyon’s Restaurant. Robertson and Cuisinot remained hidden for 30 minutes, an hour. They’re unsure of how much time passed. Authorities reached both women after Thorpe left the scene. She opened the door and peered outside. Someone told her wait until an officer reached her. The officers checked the rooms one by one. If an employee was gone and his or her office was locked, officers ripped the door from its frame, Robertson said. She opened her door when the officers reached her. They walked her to a nearby building, where she waited with other employees. Cuisinot said she feared to open the modular building’s door when authorities approached. She and her colleagues eventually did let them inside and police told them to walk out and down Willow Valley Road. Cuisinot and the others went to the end of Nursery Street. 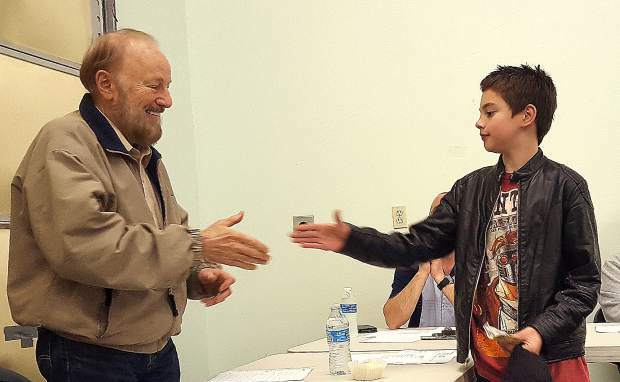 She remembers a light rain began before a bus took them to the Eric Rood Administrative Center. Officers walked Robertson to a nearby building. A room held some computers and Robertson said she searched through records in an attempt to discover the shooter’s identity. Robertson found two possibilities. One of them was Thorpe. Years later Robertson cringes at loud noises like a car backfiring. When someone gets belligerent, she walks from the confrontation. “I do like to sit with my back to the wall and facing the door, mostly when I’m out somewhere,” she said. Emergency dispatchers got the call around 11:28 a.m. that day about shots fired at the HEW Building, Sheriff Keith Royal said. The second call came at 11:37 a.m. There was another shooting at Lyon’s Restaurant, in the Brunswick area. “We had no idea that the two were related,” said Royal, who was sheriff at the time. Several agencies responded, including the Nevada County Sheriff’s Office, police, firefighters, even the U.S. Forest Service. Responding to both sites, the agencies’ missions were to keep the community safe and stop any further shootings. A command post — officers using car roofs and sitting inside their cars — soon moved to the Sierra College Drive fire station. Like many others, Royal remembers the rain that day. Authorities sent news media to the Rood Center, where briefings occurred in the Board of Supervisors’ chambers. Royal remained in his office, coordinating the response. Rick Haffey, now the county executive officer, was the assistant CEO at the time. He drove to Colfax for a meeting that morning. His hosts told him to return to Nevada County once he’d arrived. 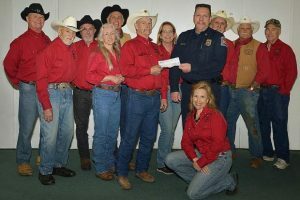 Haffey worked with the undersheriff, providing any county resources needed. He soon found himself consoling and calming fellow county employees. The information he did get came sporadically. Authorities discovered there was one shooter, that he’d first appeared at the HEW Building and then traveled to the restaurant. It wasn’t until the next day, after authorities had apprehended Thorpe, that they had a clear idea of what occurred. 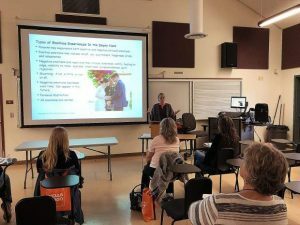 The county has since reviewed its policies and training. Many of its safety protocols are known to the public. Others remain confidential. Shootings, like the recent one in Umpqua, Oregon, always catch Haffey’s attention. He thinks about his office’s safeguards. At a meeting last month he asked other local leaders if they’d updated their active shooter drills. To contact Staff Writer Alan Riquelmy, email him at ariquelmy@theunion.com or call 530-477-4239.